Mel Kiper released his re-grades of the 2017 NFL Draft. 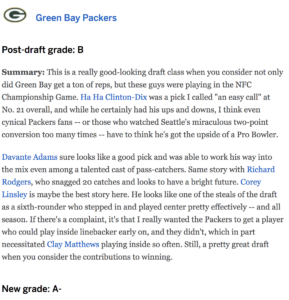 The Packers grade moved from a B+ to a B. This is completely understandable. Kevin King got hurt, Vince Biegel got hurt, Montravius Adams got hurt and Josh Jones saw just spot duty. Jamaal Williams and Aaron Jones were underdrafted. The problem with that is that Kiper re-graded the draft after just one season. The minimum for a draft class evaluation should come after three seasons. Ideally, though, it’s four. I had this discussion with Eric Thompson from The Daily Norseman (see, we can all get along). Four years is the normal length of a contract for a drafted player. First round picks also carry a team option for a fifth year. Fifth year or not, though, four is long enough for evaluation. So let’s take a look at the 2014 class. It’s been four years. Pretty strong support for the 2014 class. 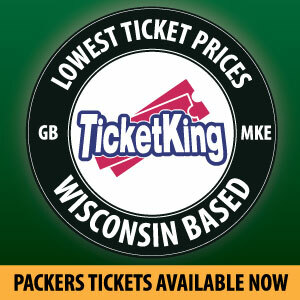 It’ll be an unpopular opinion but this was a no brainer for the Packers, and stands that way. People that are angry about the way HHCD played in 2017 forget too quickly how disastrous the Packers safety position was before Clinton-Dix stabilized it. Clinton-Dix was actually closer to average than he was abysmal in 2017, not allowing really anything behind him in deep coverage, but playing poorly around the line of scrimmage and with questionable effort. PFF ranked him 40th out of 82 qualified safeties. This was after an excellent 2015 and an even better 2016. 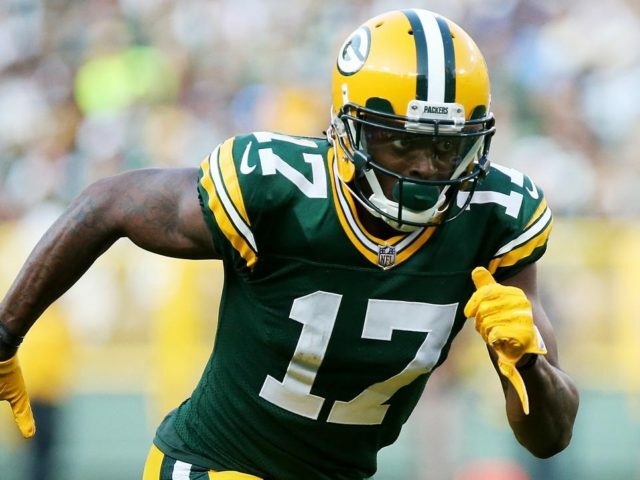 Adams came on strong as a rookie, played very poorly as a sophomore, responded with a solid third season and made it clear he was Green Bay’s best skill position player in 2017. Adams signed a big extension. This one doesn’t need to be talked about. He’s a top 15 player at his position and to get that value in the 2nd round is A+ work. Not much more needs to be said here. Thornton just never worked out with the Packers. He washed out. Spent a little time on injured reserve, but just never caught on with the team. Thornton was a guy that met the Packers athletic thresholds at the position and did little else. The only reason this pick doesn’t fail out is that Thornton is still kicking around the league. Not all third round picks can say that after four seasons. He does have some use as an NFL player. This grade will probably confuse people as well, but the fact that Rodgers started at TE as a rookie and has continued to contribute at at NFL level actually makes him about dead average. There are plenty of 98th overall picks that just flame out. His Hail Mary catch against Detroit alone will keep him a piece of Packers legend. 120 career catches and 13 touchdowns is plenty from a 3rd round pick at tight end. He’s serviceable and Rodgers trusts him. He’s still around. It was an average, not terrible pick. This is about as wrong as I’ve ever been about a draft pick. By this time in the draft that year I was on the golf course, and I remember letting out a legitimate “yelp” when Bradford was selected. He was a stocky, compact, blitzing linebacker that reminded me of Lamaar Woodley. None of that happened. He got gobbled up by offensive tackles, got moved inside and eventually washed out with the Packers. Like Thornton, though, Bradford is still kicking around the league. After four years, and at the 121st overall pick, that’s gonna mean that the draft choice, the evaluation of the talent isn’t going to be a failing grade. “Abby” got the Wisconsin Packers fan base all hot and bothered. After years of staying away from Badgers prospects, the hometown boy was supposed to be everything Badger fans wanted in Green and Gold. Unfortunately it just never worked out. Does this grading system allow A++++++++++++++++? In all seriousness, Janis may never make it as a wide receiver in this league, in fact, it’s likely that he won’t. With that said, Janis’ performance against the Cardinals alone and the fact that he’ll have longevity in the league (with the Packers or not) as one of the finest punt gunners in the world make the 236th pick a helluva value. Most 7th rounders are not in the league after two years. Bottom Line: with four years to evaluate the 2014 class, it’s clear that it was one of Thompson’s finest efforts, despite two complete busts. It produced a star (Adams), two excellent players (HHCD, Linsley), a role player (Rodgers) and two special team successes (Goodson and Janis). It’s a helluva class. I have a feeling when i re-grade the 2015 class, I won’t be so excited. This entry was posted in Authors, NFL Draft, Ross Uglem and tagged Carl Bradford, Corey Linsley, Davante Adams, draft, HaHa Clinton-Dix, Jeff Janis, Packers, Ross Uglem. Bookmark the permalink.